In double boiler over hot water, melt 3/4 pound of chocolate. Cool about 5 minutes. Inflate balloons to 4-inch diameter; knot. Holding balloons by knot, dip into chocolate, tipping to cover balloon halfway up with chocolate. Place balloon, knotted side up, on wax paper-lined baking sheet, holding balloon in place until it starts to set. Repeat with remaining balloons to make 8 cups. Place in freezer 5 minutes. Melt remaining 3/4 pound chocolate and repeat dipping procedure; place in freezer 10 minutes. Snip hole in each balloon to deflate; carefully peel away from chocolate. Refrigerate until needed. Use the same day. 1. 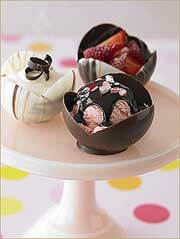 Fill cups with ice cream, sorbet, chocolate mousse or fresh fruit such as raspberries or strawberries. 2. After dipping, drizzle cups with contrasting color melted chocolate. 3. For second dipping, use contrasting color chocolate, leaving part of first dipping exposed. Note: Ghirardelli Semi-Sweet, Milk, and/or Dark Chocolate Chips or Bars may be used.